How do you help your child when the air won’t let them breathe? When air pollution is so high, and air quality is so low, that even the healthiest of us without asthma or allergies, can barely catch our breath? While I wrote this article in response to the terrible air quality we are experiencing from the tragic Camp Fire in Butte County, this information will benefit any family who is experiencing high pollution and poor air quality – whether from fires, car pollution or other environmental pollutants. Children and those with asthma and other chronic illness are most at risk for the harmful effects of poor air quality, but as air quality worsens, we are all at risk. These recommendations below will be of benefit to all. In addition, the long-term health impacts of fire pollution are yet to be seen, so a gentle daily detoxification regimen as outlined below will hopefully prevent any serious outcomes for you and your family. Please be sure to check the AirNow website for updates on local the Air Quality Index (AQI) in your city. 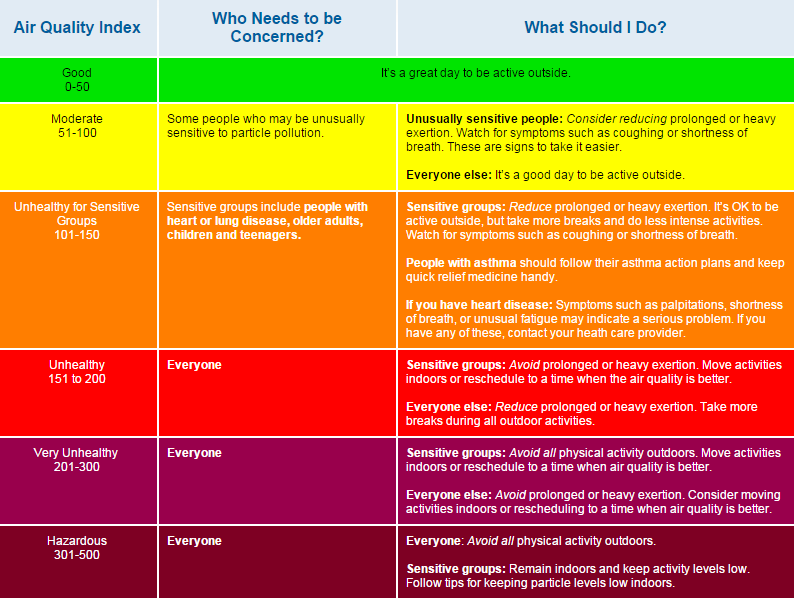 Below is a description of the various Air Quality Index colors used. As of this writing, most of the Bay Area is RED (“Unhealthy”) or ORANGE (“Unhealthy for Sensitive Groups”). 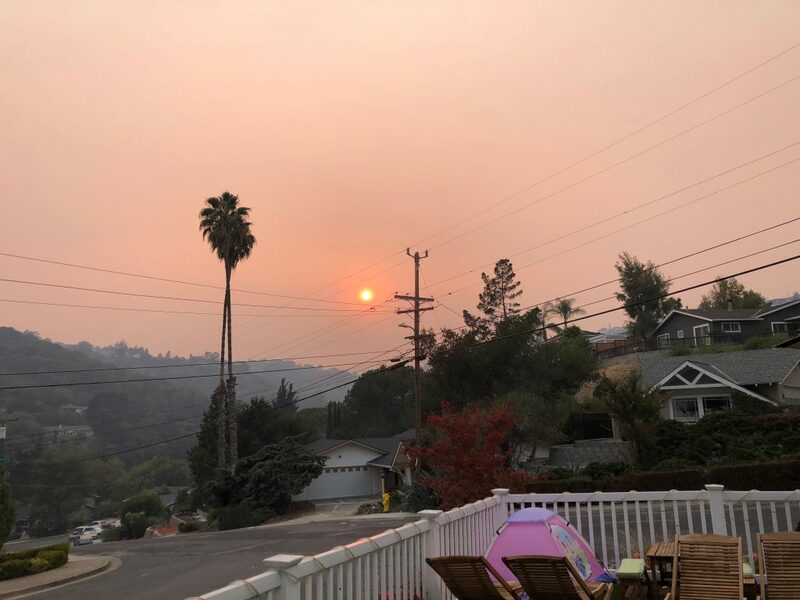 At my home today, our AQI right now was 191 – less than 10 points from PURPLE, or “Very Unhealthy.” The photo below is not of a beautiful sunset outside my door – it’s the sun in the early afternoon obscured by the brown-orange haze that is covering the sky and making my eyes, throat and lungs burn. During the poorest air quality days, it’s important to limit outdoor activities and stay indoors as much as possible, especially for our most at-risk kids. Ensure that schools hold PE indoors, and cancel sports and other outdoor activities until the Air Quality Index is at Orange for most kids, and at Yellow for kids with asthma or allergies. While trying to stay indoors as much as possible, we’ll have to venture outside at some point, whether it’s to go to school, work, or a quick-as-possible trip to the grocery store. During these times, consider wearing a mask. But not just any old mask. If you’re going to go through the trouble of having your child or family member wear a mask and have it provide any benefit. then it must be a “Particulate Respirator Mask” that filters at least 95% of small smoke particles and is marked “P95,” “R95” or “N95, has 2 straps, and forms a tight seal around your nose and mask. Most regular masks like surgical masks don’t actually provide any protection from inhaling small particles or gases from smoke or air pollution – they’re actually meant to filter air coming OUT of the wearer’s mouth. A properly fitted respirator mask should be worn OVER BOTH the nose and mouth, and form a tight seal so that you can’t smell any ambient odors – a good test is to put on the mask covering your mouth and nose, pinch the mask across the bridge of your nose, then spray peppermint or lavender essential oil in front of your face. You should not be able to smell or taste any of the oil in your nose or mouth through the mask. THE PROBLEM: Most masks won’t properly fit and create a good seal over a young child’s mouth and nose to filter out small smoke and air pollution particles, so make sure you follow the recommendations below. • As obvious as this may be, keep doors and windows closed at all times, with good seals around the edges. • Take off shoes and jackets by the door. Changes clothes and rinse off as soon as possible so outdoor particulate matter is not tracked throughout the house. • Vacuum daily with a vacuum that has a HEPA filter. • Invest in greenery. Indoor plants like gerbera daisies, peace lilies, chrysanthemums, ferns, spider plants, and aloe vera have been shown by NASA research to purify the air naturally. Check out this article for more ideas. • Use a HEPA air purifier that removes airborne particulate pollution from the smoke, like the Austin Air filter. The Environmental Protection Agency also has a guide to choosing air purifiers. • Some air conditioners will actually improve indoor air quality by circulating and filtering indoor air, as long as your air conditioner is regularly cleaned and maintained and is not drawing air from outside. • Diffuse essential oils to help keep indoor air clean and support respiratory health. Some of the best essential oils for this purpose include: Eucalyptus, oregano, thyme, peppermint, lavender, and tea tree. The most immediate concern during the fires is the effect of smoke inhalation on our most susceptible individuals, including young children and people with asthma and chronic disease. Unfortunately, we also need to be concerned about the long-term health effects of the fire’s particulate matter that is filled with toxic materials from burned debris, including heavy metals such as arsenic, cadmium, copper and lead, pesticides and herbicides, polycyclic aromatic hydrocarbons (PAHs), asbestos, and polychlorinated biphenyls (PCBs). With very high air pollution ratings in the Bay Area, awareness needs to be raised that EVERYONE, not just “at-risk” populations, needs to be aware of the long-term health impacts of this particulate pollution, including new-onset asthma and chronic effects of toxic exposures from burned materials. Daily epsom salt baths to support detoxification and enhance magnesium and glutathione levels. Liposomal glutathione to support respiratory and immune health and aid in detoxification. We carry various forms of liposomal glutathione in capsule, liquid, and gel (Readisorb liquid liposomal glutathione, Quicksilver liquid liposomal glutathione, Researched Nutritionals Trifortify orange-flavored liposomal glutathione gel, and Pure Encapsulations liposomal glutathione capsules). Extra magnesium for patients with asthma to support lung health and reduce bronchial spasm and wheezing. Essential oils to support immune and respiratory health. As many phytonutrients as possible to help reduce inflammation and oxidative stress, and support detoxification. What does that mean? EAT A RAINBOW of fruits and vegetables. Pack in daily “green smoothies” with as much chlorella, cilantro, and parsley as the kids will tolerate. Throw in beets, ginger, and turmeric for added detox and anti-inflammatory support. Probiotics, fermented foods, and optimal gut health are key to supporting detox and immune health. Download my Guide to Choosing Your Child’s Probiotics to know which probiotic supplement is best for your child. Regular exercise and sweat is an essential part of detoxification, but while the air quality remains poor, keep the exercise to indoor activities and consider an infrared sauna if you have access to one. Stay hydrated. Ensure optimal urine and stool output – we get rid of most of our toxins by pee, poop, and sweat! Reduce total toxic burden by eating organic (at least the foods that are on the Environmental Working Group’s Dirty Dozen list, and whole unprocessed foods as much as possible, drinking clean filtered water, avoiding artificial flavors, dyes and preservatives, eliminating plastics, BPAs, parabens, phthalates, and other toxic everyday chemicals in our personal care products, cleaners, and other household items (the Environmental Working Group’s Healthy Home Tips is a great place to start). Hopefully these tips will help you and your family breathe easy even in the face of poor air quality. Stay safe and healthy, and please share this with any family you know who could benefit. Thank you so much for your very informative and supportive article. Our children thank you also. Which magnesium product do you recommend for children? Hi Jessie – I typically use the Designs for Health Buffered Magnesium Chelate powder or capsules. They actually have their own Amazon store so theirs are some of the only products I am ok purchasing through Amazon because their quality will be guaranteed… Good luck! Thank you for this information. We are not in California but in Charlotte, NC. My oldest child though is a freshman at the University of Tampa. We thought that she had outgrown her asthma years ago but is complaining of difficulty breathing at times in Tampa. She will be home for too short of a time during the holidays to get in to be tested and even so, the same symptoms may not show up outside of Florida. I began following you in my research over the years to help this child as she suffers from post concussion symptoms from a head injury in 2012 at the age of 12. She has not slept for more than several hours at a time in the six years since her head injury and now away at school, it is even worse as she has a recurring dream every time she sleeps. She has found the most relief from the headaches through neurofeedback but again getting enough sessions in during the Christmas break will not be enough to provide relief for the symptoms. During a recent FaceTime with her, I could see that her eyes were dark. I have most recently read, Why Isn’t My Brain Working by Datis Kharrazian which details assistance so many by connecting the body with the brain. Our pediatrician is unable to help us. I fear that without sleep, my child is going to have an accident of some type resulting in further injury. I should add that she gave up seeking medical help after years of prescriptions and empty promises so she is reluctant to listen to anyone. She connected with the young, female doctor providing the neorofeedback and that is the only reason she continued until some relief was felt. I realize without doing a complete blood work up, it is impossible to determine her deficiencies but is there a supplement that would not have adverse effects that you can recommend? Any small piece of advice? I will add that this daughter is an amazing care giver to the young, old and ill and is presently in her first semester of college with plans to go into nursing. Hi Catherine – your daughter sounds like a remarkable young lady. I would suggest that she consider seeing Dr. David Berger in Florida (https://wholisticfamilycare.com/). 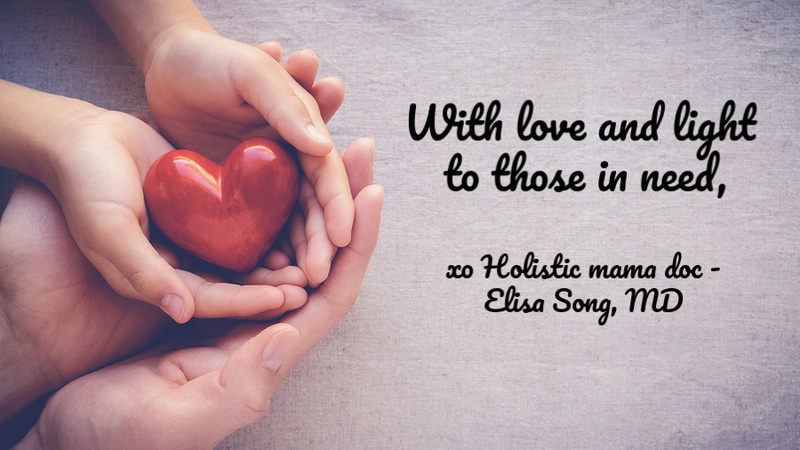 He is an integrative functional medicine pediatrician who sees kids with all sorts of complex and chronic health concerns and takes a root cause approach to healing. Best of luck to your amazingly resilient daughter. Thank you so much for compiling and sharing this excellent and useful information! Thank you, Dr. Song for this valuable information. I’ve forwarded it to all of my friends. Thank you so much for sharing . Invaluable information!! What essential oils do you recommend? Hi Ana! I would try peppermint, lavender and lemon to support respiratory health and detox. Stay well! How do you like Hylands number 8 magnesium? My toddlers love the little dissolvable pellets. We live in Santa Barbara… still feel traumatized by last years fire… in denial that we’re having to deal with another atrocity again already! But appreciate your advice. I purchased two of the Austin air purifiers last winter when our skies were eerie orange & it was raining ash for weeks on end. They’re fantastic & the white noise they give is actually so pleasant. We run them both day & night. This great doc! Thank you so much. Really! Any teas or other foods that are detoxifying? Hi Payel! Yes – cilantro and parsley in smoothies is great for detoxification. And I love teas with ginger, dandelion and cardamom – perfect for the cold weather coming in!